Here at Edulab, we pride ourselves on being a leading UK manufacturer of a range of Fume Cupboards for various laboratories, including Schools. A laboratory fume hood primarily provides localised ventilation and protection against toxic fumes, vapours and dust. It also protects against chemical spills and fires by acting as a physical barrier. 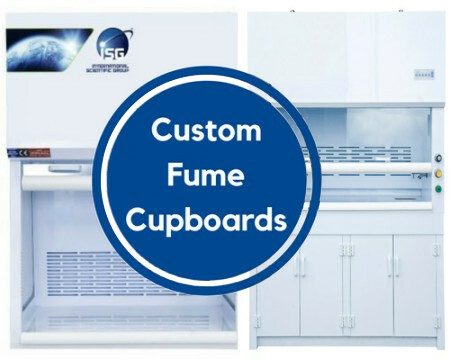 At Edulab, we manufacture custom fume cabinets and cupboards tailored to your requirements. "We Make Them The Way You Want Them!" The ideal material for the construction of Fume Cupboards is Polypropylene. Not just any PP but Virgin medical grade welded PP. The PP we use offers much higher chemical resistance than other materials used by competitor’s products (such as mild steel with a thin coating). • For single person use, we recommend between 600 and 1100mm width. • For 2 users, we recommend between 1400 and 2000mm width although the optimum is 1500mm as it provides enough space without wasting valuable lab space and more importantly the School/College’s funds. Often large fume cupboards (and Multiples of them) are recommended by suppliers whose priority is maximising order size rather than end-user satisfaction. Some good examples (or bad as it turned out) are a UTC who were supplied with an excessive amount of huge fume cupboards (15+!) and Secondary School (26 cupboards!) which has proven not only to be a waste of money but has caused issues with maintaining heat in the building. Every unit supplied must have this to ensure that the airflow is maintained at the minimum of 0.5m/s inflow as recommended by the British and European requirements. Also, we recommend wipe-clean touch panels to ensure easy maintenance ongoing. Lighting is very important to ensure safe practice and the obvious choice is LED as it offers very long life with excellent clarity. Older types such as fluorescent tubes can prove troublesome. At Edulab, we can customise 100% of our units including depth, width, height, materials used, number of electrical sockets, gas taps, water taps, sinks, sashes and stand options. Decide what suits you, your school and your application and go with that. Don’t be coerced into buying a “standard” size or specification just because that is what you are offered. We have a wide range of selection that ranges from ductless mobile fume hoods to fixed, filtered fume cupboards. You can choose a simple light duty enclosure, a sophisticated hood or specialised ventilation equipment for unique applications.